This was a very exciting order from a gentleman building his own set of Klingon armor from scratch. He was specifically looking for a replica of the pouch worn by Christopher Lloyd in Star Trek III, which was just as well because that was the one we could more than one image for. There's been a few variations over the years, and even within that one film. Looking at the images, I've wagered that the prop department took somebody's old couch and wrapped the upholster around a block of wood to make their pouch. It'd certainly be a fast way to knock a pouch together if they weren't worried about it being useable. I was able to calculate the dimensions using a little photogammetry as 6.5" tall, 2" deep, and 2.75" wide (just right if you're looking to carry a whack of pencils and pens I guess). I didn't have any old couches on hand (and these days upholstery's all artificial leather anyway) so I went with stone oiled leather. To get the rigidity and sharp corners I made what amounts to a latigo box or lining and then wrapped the pouch around that. With the outer layer holding all the latigo in place the whole box is surprisingly sturdy. So much so that I'd compare it to 1/4" plywood or plexiglass, except that this won't risk cracking or splintering. A note on the photos: As is increasingly the case, I didn't have time to wait for the perfect outdoor conditions before shipping the order. 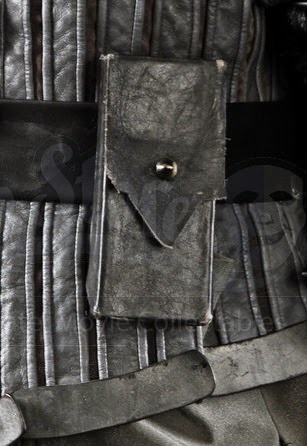 In this case it was a particularly overcast day and all the diffuse natural light is making the matte black leather look more silver or grey.